In a bizarre incident that could have ended up being tragic, an interstate loaded truck driven by an intoxicated driver razed down five shops on Saturday midnight at Poinguinim Bazaar. Canacona police booked the truck driver R Shekar, a native of Telangana, for rash and negligent driving in a drunken state, and causing losses amounting to lakhs of rupees. The truck bearing registration No TS-29 T-5247, which was loaded with steel bars, was coming from Fatorda and proceeding to Andhra Pradesh. 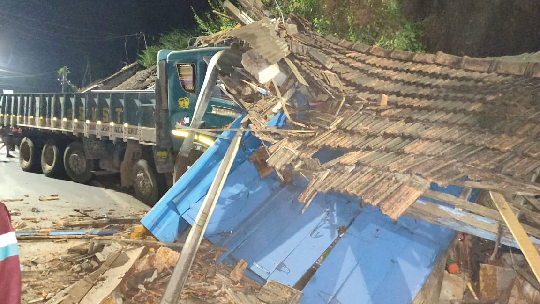 On reaching the narrow stretch of road at Poinguinim Bazaar, the loaded vehicle first hit the residential gallery of a house belonging to one Suresh Agni. The gallery of the house and front door was destroyed in the incident. The truck rammed into five shops that included two general stores, a barber shop, sandal store and one tailoring and cloth shop belonging to Gunk Rivankar, Vinod Poinguinkar, Shashikant Poinguinkar and Viraj Mahale. On hearing a loud sound, most of the locals who were deep in their sleep at about 12.30 am (Saturday midnight), rushed to the spot and found the truck driver had fled the scene. They immediately called up the Canacona police station. The police reportedly found liquor bottles inside the truck cabin. Later on, the driver appeared before the police and was found to be in a highly intoxicated state. After the police took him into custody, he was referred for a medical test. The alcohol content report is still awaited. According to the police, based on the alcohol content report, the driver will be booked accordingly in accordance with the law and further investigation will be carried out. People have been bitterly complaining of increasing number of heavy vehicles on the highway after the closure of Anmod-Ghat section some months ago. are responsible for several accidents.